Antonio Caldara; Antonio Vivaldi; César Franck; Gabriel Fauré; Geminiano Giacomelli; George Frederick Handel;... Very Good. In very good packaging. 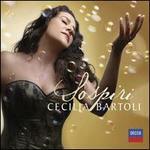 Cecilia Bartoli-Sospiri by Cecilia Bartoli. Antonio Caldara; Antonio Vivaldi; César Franck; Gabriel Fauré; Geminiano Giacomelli; George Frederick Handel;... Fine. In fine packaging. Cecilia Bartoli-Sospiri by Cecilia Bartoli. Very good. The case show limited signs of wear, as may the cover art, liner notes and inclusions. A well-cared-for CD that has been listened to, but remains in great condition and plays perfectly. This is a ex library CD, case, stickers and markings accordingly. Tracking number issued for every order. 100% satisfaction guaranteed.